Winner of eight Grammy awards, for five decades Miles Davis was one of the most innovative and important performers of jazz music. Late in his life, Miles Davis began experimenting with the visual arts. According to his website, in contrast to his rich formal education as a musician, Miles Davis as an artist was mostly self-taught. His early artwork was inspired by the Milan-based design movement known as “Memphis” whose theme was based on hot colors and clashing shapes. His later work changed direction. He began integrating swirling abstracts and strong African inspired textures. He is said to have filled his studio with tribal masks and haunting images of African art, incorporating the essence of this rich imagery into his paintings. 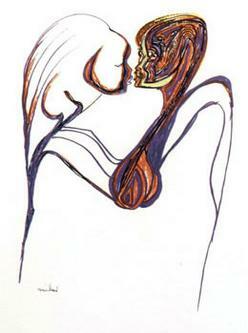 The image posted here is “The Kiss” by Miles Davis. See the Pop Life Art homepage for links to the artwork of Miles Davis and other musicians, singers, and actors.